Madonna has been one of the most controversial characters in the world of popular culture. Carving a career out of shocking the public, the Queen of Pop has picked up religious symbols and used them in ways that have upset the conservative time after time. Some have criticised her of trivialising sacred imagery with her antics whereas others have praised her for her boldness to break taboos. Like it or not, she has been one of the most iconic pop heroines ever since the birth of pop culture. She's been like a chameleon, reinventing herself again and again with envelope-pushing audacity. And arguably, none of her transformations has been quite as remarkable as the one that was marked by the 1998 album Ray of Light. The album was quite a departure from Madonna's previous work: it features a range of more alternative and electronic music influences from techno to trip-hop and was recorded without a live band. Thematically it's a highly spiritual record, drawing from Madonna's conversion to Kabbalah and her interest in oriental religions, which on paper sounds like it could be pretentious and forced - this was the woman who had previously sung about material girls and virgins touched for the very first time, after all. Fortunately, the new and, in hindsight, pretty unexpected direction works beautifully, most significantly due to William Orbit's superb production and Madonna's vocals that show more depth and emotional range than before. The vocal lessons she took for Evita certainly paid off. Orbit's production is top-notch and ambitiously innovative throughout the record. (And heaven knows I like my pop music experimental!) There's stylistic variety in the individual tracks but the general soundscape is consistent so the album feels like a solid, coherent body of work, each song radiating with the distinctive Ray of Light sound. And considering it's Madonna we're talking about, you're likely to be already familiar with the singles: from the gorgeous "Frozen" to the hi-energy stomper "Ray of Light", the album yielded some of her most famous tunes. However, the album tracks do not pale in comparison, and the level of quality remains high from start to finish. The duo's experimenting with less-mainstream electronic styles is equally important in making the album as fascinating as it is. "Skin", one of the strongest tracks on the album, is a sinister number with a pulsating techno-inspired beat. Exotica is incorporated with occasional touches of Middle Eastern woodwinds and singing styles. Another, considerably more upbeat example of urban influences is of course the zestful title track "Ray of Light", the most club-friendly tune out of the bunch. But did you know that the song is actually a cover? The original version was a 1971 folk song called "Sepheryn" but here it is radically remade into a new wave styled anthem. Actually, the only things that were taken from the original song were the lyrics and the melody of the verses, so I guess it's more of a remake, a reinterpretation rather than a cover in the traditional sense of the word. Anyway, it's easily one of the best Madonna singles of all time. With the exception of "Sky Fits Heaven" and "Nothing Really Matters", most of the album is however more mid-tempo and on the mellow side, and while it does feature catchy beats, it is not as dancey as many of her previous efforts. In that sense, Ray of Light can be seen as a very confident and mature record and Madonna shows that a pop album doesn't need to be 'poppy' to be good. "Swim" for example, despite its relaxed arrangements (laid-back guitar, humming, ocean sounds and that deliciously '90s-sounding bass, typical to the decade's alt-rock) describes desires of escapism from the fucked-up world we're living in. Swimming "to the other shore" is used a metaphor for an act of purification: "Let the water wash over you / Wash it all over you / Swim to the ocean floor / So that we can begin again / Wash away all our sins / Crash to the other shore". The equally '90s alt-rock-influenced "Candy Perfume Girl" could even pass for a Garbage song. It's not like Ray of Light sounded completely detached from Madonna's previous work, though. The ballad "The Power of Good-Bye" and the more danceable "Nothing Really Matter" both recall classic '80s Madonna. Incidentally, both were released as singles. And while they are excellent singles, sonically they're probably the least representative Ray of Light tracks. That is not the case with "Drowned World/Substitute For Love" - a very brave choice for a single release, mind you - which, along with the back-to-back trio of "To Have And Not To Hold", "Little Star" and "Mer Girl", represents the dreamier side of the album. Its retrospective lyrics give a glimpse into Madonna's life "I traded fame for love / without a second thought / It all became a silly game / Some things cannot be bought" while also referring to her spiritual awakening: "Now I find I've changed my mind / This is my religion". Ray of Light must've been quite the surprise for pop enthusiasts when it came out, but it's an exceptional album with the Queen of Pop like never heard before. There was a time when Madonna used to create trends rather than emulate them, and this album is a prime example of those times. Even after 16 years it succeeds in sounding extremely fresh and relevant which serves as a proof of its brilliance. Not a single moment of it sounds dated or passé, because it didn't try to be 'current' to begin with, although it did embrace elements from the electronic music scene bubbling under the mainstream. It is also a fantastic example of an artist's reinvention and brought new elements of versatility into Madonna's work. For some reason, pop is sometimes seen as inferior to rock music, regarded as dispensable and shallow, but thrilling, creative albums like this confirm that pop can be every bit as artistic and innovative as a music genre. 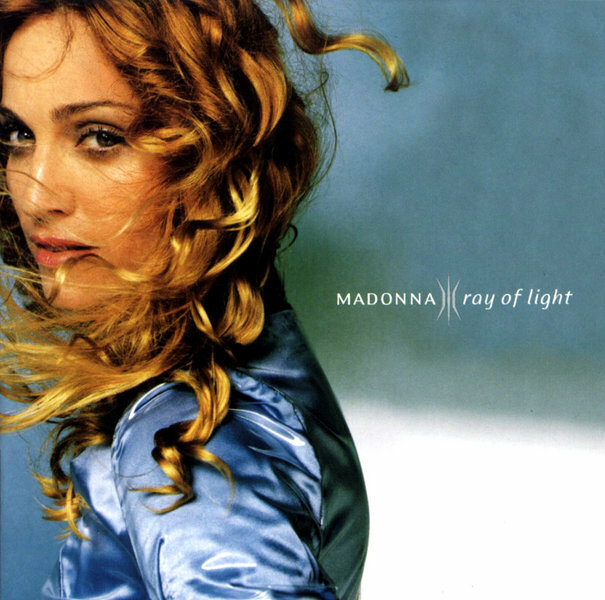 Orbit's flawless production, Madonna's adaptability and their brilliant songwriting make Ray of Light a spectacular pop album and quite possibly her best one to date. Try at least: "Ray of Light", "Frozen" (although I know everyone's familiar with them already), "Skin", "Swim", "Shanti/Ashtangi"